Less than a month after celebrating its 150th anniversary, Howard University’s College of Medicine is in danger. A D.C. council vote on Dec. 4 may finalize approval of a bill that would jeopardize the future of Howard University Hospital as well as the medical, dental and pharmacy schools. The bill will would expedite construction of a new 150-bed hospital servicing Wards 7 and 8, as well as a 270-bed tower on the Foggy Bottom campus of George Washington University by removing the certificate of need process. There is no doubt that the area needs a hospital. There is currently no place east of the Anacostia River capable of delivering a baby since the shutdown of United Medical Center’s maternity ward. Howard University then expanded its maternity ward to service patients from wards 7 and 8, as D.C. has the highest maternal mortality rate in the nation. 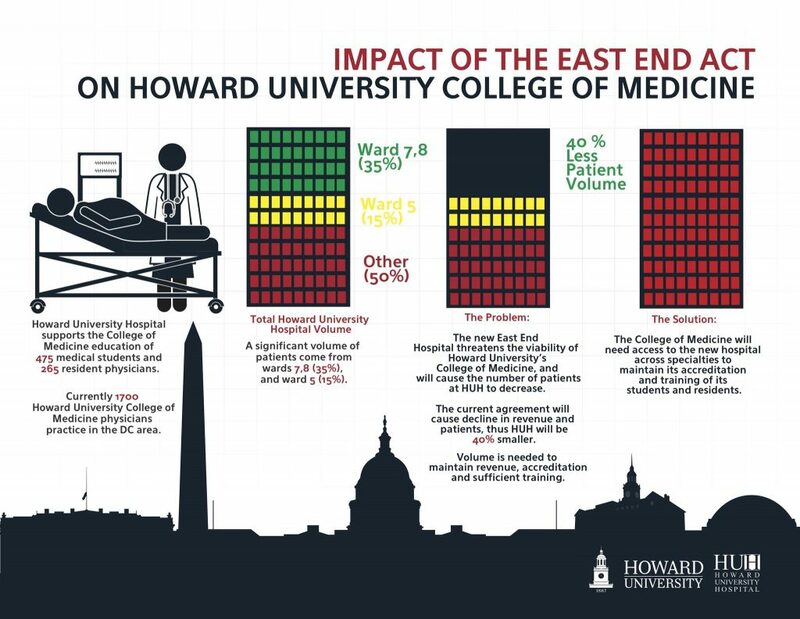 Thirty-five percent of Howard University Hospital’s patients come from east of the Anacostia river, in wards 7 and 8. “We support having a hospital there. However, the current proposal will exclude Howard’s faculty, physicians, medical students and residents, nursing and allied health, pharmacy and dentistry students from providing services and receiving training in the new hospital,” said Howard University President Wayne A.I. Frederick. Historically, African-Americans have a general distrust of the medical system. However, a study presented in the Harvard Business Review suggests that African-American patients are more likely to receive effective care from people who look like them. Howard University is currently the largest producer of African-American physicians. Exclusion from the hospital in Southeast D.C. would drain revenue from Howard University Hospital and “disrupt the pipeline of 750 minority physicians in training,” said Frederick. In December 2017, the university submitted a proposal to partner in building the new hospital. The city had hired a consultant to look at solutions to providing better care for Wards 7 and 8. President Frederick says he was not aware of any other entity submitting a proposal before the December 22 deadline. The university did not hear back from the Mayor’s office until the announcement of its plans to partner with George Washington University in August of this year. The plan looked eerily similar to the proposal that Howard University submitted. “The process just wasn’t fair,” said President Frederick. Howard has filed a Freedom of Information Act request to investigate the proposal process. The Mayor’s office did not respond to requests for comment. Mark Diaz, George Washington University’s executive vice president and chief financial officer, also voiced concern, stating in a letter to the Advisory Neighborhood Commission that the university is “not supportive,” of constructing the tower on its campus.